My new wireless router decided to stop working at the weekend. It has been behaving rather strange for the past few days. I’ve tried power cycling in the vain hope a reboot may fix the issue. Which it didn’t. And to make things worse now it wont even boot. Pinging it gets no response either. The original firmware was replaced with DD WRT, a great Linux alternative firmware, so the first thing I did was head over to the DD WRT homepage for help. I tried the recommended 30/30/30 reset procedure which didn’t solve the issue. Luckily there is a ton of resources out there surrounding these routers. Once such resource I found extremely useful was the OpenWRT Wiki page. Apparently the WDR4300 has an Atheros AR9344 SOC running at 560 MHz with 8MB of flash and 128 MB DRAM. It also has both a JTAG and serial programming/debug connection. The flash memory is made up of the boot loader (U-Boot), the operating firmware and the ART (which contains MAC addresses and calibration data for the wifi). It’s also the boot loaders responsibility for configuring the serial interface. With nothing to lose I begun disassembling the router to see if I could get access to this serial port and maybe diagnose the problem. After removing the aerials and the screws holding the case together I had the router disassembled. There are two unpopulated headers one 14 pin, which I assume must be the JTAG connection, and one 4 pin which turns out to be the serial connection. The four pins comprising the two supply lines and the TX and RX lines. I soldered in a pin header to the board and connected my USB to serial converter. The connection settings according to the OpenWRT Wiki page are 115200 8N1 with no flow control. Using puTTY I managed to capture the routers output during power up. The output shows the boot loader initialising the serial port. After initialisation the boot loader attempts to auto boot the image at address 0x9F020000. Firstly by uncompressing the kernel image and then starting it. Additional serial output follows before we encounter a raft of file system page read errors before stopping. So it appears the firmware may have become corrupted. The obvious next step then was to try re-flashing it. After some reading around on the subject (being a complete Linux novice) I discovered the boot loader supports network transfer via the Trivial File Transfer Protocol (TFTP). So it is possible to transfer the firmware image via TFTP and re-flash it. The first step was to download the required firmware images and other supporting software. I downloaded the DD-WRT firmware image files from here and then downloaded and installed the client side TFTP server program TFTPD32 from here. The next step was to break execution of the boot loader in order to run tftpboot. To do this, within putty after power cycling, simply wait for the message “Autobooting in 1 second” to appear begin typing “tpl” and pressing enter until the sequence stops and the prompt “db12x>” appears. Once the prompt appeared I ran “tftpboot”. I then made a note of the expected server address “192.168.1.100” and load address “0x81000000”. I then exited tftpboot by pressing Ctrl+C. With the router connected directly via an ethernet cable and all wireless adaptors disabled I set the network adaptor to the static IP address “192.168.1.100”. I then ran TFTPD32, browsed for the folder containing the firmware images and set the server address to “192.168.1.100”. I then ran “tftpboot” again with required load address and source firmware parameters. The new firmware then begun transferring. Upon completion the message “done” appeared and the number of bytes transferred was shown. Before the new firmware image could now be copied the destination flash the destination flash first needed to be erased. The destination address being 0x9F020000 (which we know from the initial captured output) and destination length being the size of the transferred firmware image 0x7C0000 bytes. Once erased the new firmware could then be copied over from the destination flash. Again the destination address being 0x9F020000, the source address being 0x81000000 and the length 0x7C0000 bytes. So that all appeared fine all that all that remained was to reboot and hopefully everything would be working. Much to my relief that appeared to have fixed the issue. The router now booted fine and I was able to access to the DD-WRT web interface. I then went ahead and performed a web flash using the web flash firmware image file previously downloaded. I am not entirely sure this stage was necessary but some of the guides I had read previously did and I cant imagine it would do any harm doing so. So overall a great result. Saved myself some money not having to rush out and buy a new router and learnt a little bit about Linux in the process. 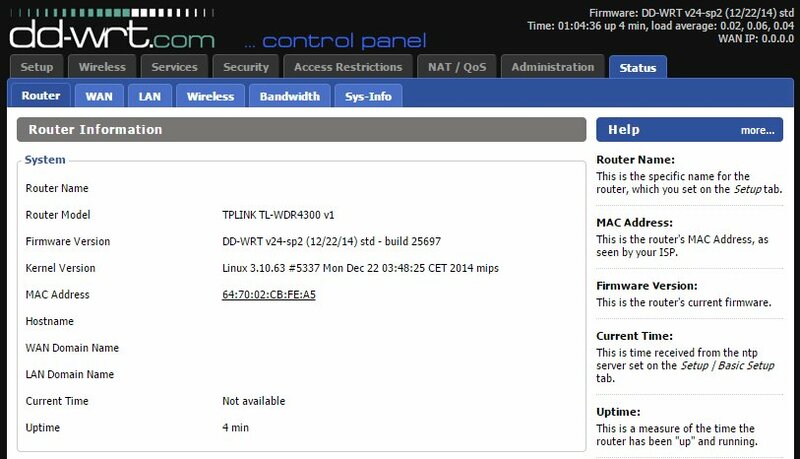 This entry was posted in Blogging, Teardowns and tagged AR9344, ARM, Atheros, DD-WRT, Flash, Linux, OpenWRT, router, TFTP, TFTPD32, TPLink, Uboot, WDR4300 on March 23, 2015 by mikesmodz. Found myself with a bit of free time this evening so I decided to port my mod player code over to the STM32 Nucleo F401 development board. I haven’t bothered with a display and rather than using an SD card I have converted a couple of modules (using bin2c) and included them in the code. The HWB on the Nucleo is used to move through the mod files stored in the device. This entry was posted in Blogging, Projects and tagged ARM, Computing, F401RE, Mod player, Nucleo, STM32 on March 18, 2015 by mikesmodz. For anyone whose interested I have finally got around to setting up my GitHub account. The only repository on there at the moment is my Stellaris Launch Pad MOD and S3M player StellarPlayer as requested but I will endeavour to add more in the future. This entry was posted in Blogging, GitHub, Projects and tagged Arduino, ARM, Microcontroller, Microprocessor, Mod player, Nucleo, Stellaris, STM32 on March 18, 2015 by mikesmodz. Over the last couple of days I have been somewhat struggling to get a TFT display module I recently purchased from eBay working. 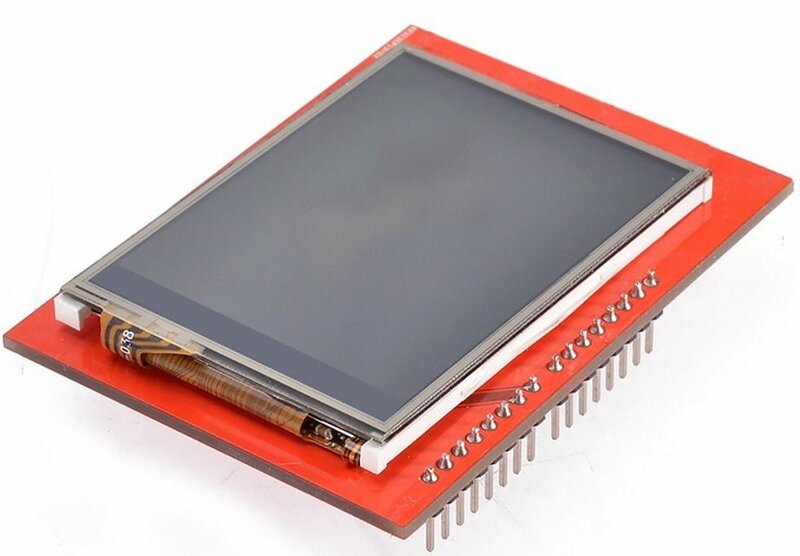 There seems to be an abundance of posts littered all over the internet regarding these cheap Chinese TFT displays. The problem seems to be that sellers are miss stating the controller these modules are fitted with. The module I purchased allegedly had an SPFD5408 controller fitted. The reason I went for this module was that it has a Arduino Uno foot print so should be compatible with the Nucleo development board. Another bonus is it also comes with a 4 wire resistive touch screen and micro SD card socket. As you can see from the pin out the controller uses an 8 bit parallel interface with a further five dedicated control pins. So using my Nucleo development board I started writing a basic driver, something to simply initialise the display and maybe draw some simple test patterns just so I could confirm it was working. I find the biggest issue with any TFT display module is initialisation. There are normally a whole host of registers within the controller which need setting up before you can start writing to the display. Now I am not a big fan of datasheets. They are a necessary evil in my opinion. Some times you have no choice. But if I can figure things out without having to refer to a couple of thousand pages a broken English then all the better. With that in mind I did a quick search for the controller supposedly fitted to the module, hoping to find example code or maybe an Arduino sketch which I could extract the initialisation sequence from. To cut a long story short I ported sequences from numerous sources trying to get this module working to no avail. Rather worryingly it was looking like I may have to start referring to the datasheet for help after all. Then by chance I stumbled upon an Arduino sketch which had a simple driver check built in. It turns out the first register (index 0) in these controllers often contains a controller ID. Reading this register resulted in the ID 0x7783 being returned. Now from previous hunting around I know a common controller used on these cheap TFT display modules is the ST7783. Surely it couldn’t be that simple right? Well turns out it was that simple. Armed with this information I found a sample initialisation sequence and surprise surprise the display now initialises perfectly. So the moral of this story don’t always believe everything you read especially on eBay. This entry was posted in Blogging, Projects and tagged Arduino, ARM, eBay, Electronic Load, F401RE, Nucleo, Orise Tech, Sitronix, SPFD5408, ST7735, STM32, TFT on March 18, 2015 by mikesmodz.